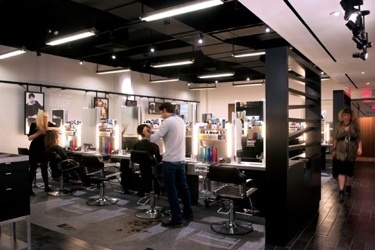 NEW YORK – Bumble and bumble, the iconic New York–based professional hair care and styling product company, re-opened their newly designed Uptown Flagship on September 12, 2012. The redesign, executed by omni//form, was the result of a collaboration between the two creative companies with the goal of transforming the client salon experience. “It is important to first focus on what the consumer should experience in every instance while she is in the salon”, says Péan. “This goes beyond interiors and architecture and includes all aspects of service. Once we agree on how this should look like, we derive design ideas from the story and build the environments around it to bring it to life. This is a design strategy which omni//form has developed to respond directly to marketing centric tasks in the retail business. The resulting design adds new features and reorganizes the customer experience sequence linked by graphics and structural hair centric textures. The new retail lounge at the front of the store is accessed by a new enlarged entrance. It is defined by black and very graphic linear shelving structures that feature next to the full product line assortment interactive “try me” zones with touch screens, ipads and video content for customers to inform on product offering and usage. The display walls feature memorabilia to highlight this salon’s importance in Bumble’s past. For the interiors we chose raw materials and black and grey paint finishes throughout the salon in continuation of Bumble’s existing visual identity. The cutting floor stations have been enhanced with product displays so customers can see and touch the product that is being used on them. Through ipad support they will be able to not only entertain themselves during services but also buy products and order light snacks and drinks.The east wall of the cutting floor features the new “wall of heroes” highlighting photographs of Bumble’s most creative talents. The hair wash area has been reprogrammed to include a comfortable waiting lounge, surrounded by library shelves with themed literature, magazines and inspirational imagery. 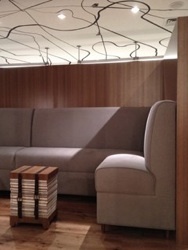 The ceiling features a handpainted mural by Artist Jay Lohman in complementation to Bumble’s signature textures. Phase 2 of this salon overhaul will re-define the coloring experience on the upstairs level as well as the link between the two floors.